What is SlabGasket made of? SlabGasket is an extruded, flexible vinyl (PVC). It is similar to the material used in window gaskets found in high rise buildings vinyl shutters, doors, etc. Does SlabGasket come in different sizes? Installation can be as easy as scratching out the rotten wood and stepping in SlabGasket. Or, one of our approved installing dealers can do the job for you, in limited areas. Does SlabGasket installation require any special tools? You may already have the tools you need to SlabGasket your own home. There is an installation kit our installers use which contains some special or modified tools. The ease of installation is fully dependent on the degree to which the existing expansion joint is rotten or missing. Can you walk on SlabGasket? Absolutely. An empty or missing expansion joint is not only ugly, it is a trip or fall hazard as well. SlabGasket can withstand over 200 pounds per square inch. Breaking a heel, or worse, will no longer be an issue. Any wheeled toy or appliance won’t get stuck. Does SlabGasket keep weeds from growing? Tight fitting SlabGasket does significantly impede weed growth. The really great benefit is that, if necessary, you can install SlabGasket and later on, pull it back up, clean out what might be necessary, and put it back in. What colors does SlabGasket come in? 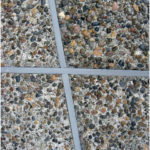 The original Gray color of SlabGasket was selected to be the most effective complementary color to best blend in with the color of most concrete. Our Almond color is also available in all sizes . Custom colors would be available in large quantity. Contact our offices for more details. How do I get samples of SlabGasket to test in my driveway? You may order a sample pack of our different sizes through our online store. Due to the large volume of requests, we must charge $9.95 for shipping and handling. If you live in the Houston, TX area, you may drop by to pick up your free samples.